I'm looking to get a gallon of paint mixed at the local autobody paint store today and would like to see the difference (painted and dried on a tractor) between the IH-50 (older darker color) and the newer IH-2150 shades. I've used 2150 and realize it has more of an orange "tint" to it but not bad. The IH-50 is darker I hear and I think I would really like that, but after seeing a sample swath from an online paint chart it looks maroon and almost brown. Does anyone have any photos they could share of their tractors with both shades of IH red so as we could all see and compare the differences? I do realize it isn't perfect as preparation and current painting conditions will also dictate the way the color looks. FWIW Guy Fay's Letter Series Originality Guide states that there really isn't much difference between the two. Now this is my opinion/perception but to me, it seems like the orange-y tint of the 2150 is less when you put on multiple coats. Also I think it's a deeper red on top of a good quality primer. I just about have Old Ugly ready to go, it was painted with 2150 straight from the caseIH dealer, we used PPG hardener and reducer in it (I can get you the number) and though it may be my imagination it seems like it is a deeper red than what I am used to with a rattle can of 2150--I'm very happy with it for my first attempt at painting. My pretty Super A was painted with Dupont Nason. The code was 96766 which is supposed to match 2150, Dupont it calls American LaFrance red. I have always thought it was a nice deep red, when I get Old Ugly running again it will be interesting to park them side by side and see if there's a difference. Agreed on the orange tint. If it looks orange, it needs more coats of paint. Unfortunately colors don't always translate well in photos, so IMHO any pictures wouldn't tell you much of anything. I remember reading somewhere that Kodachrome film did something to the color, and Ektachrome film did something else to the color, so there are no pictures out there that truly show IH red "in the day." The Nason Fulthane number is 27146ib. Thats for a urethane paint. Thanks for the reply Al. Yeah I feel the same as you about the 2150. 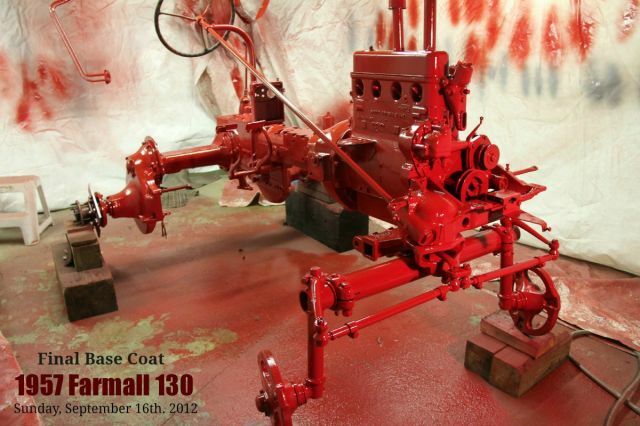 Everyone says it has an orange tint to it and I've seen it before but when I painted this 1960 Farmall 140 with Case/IH Ironguard 2150, it came out a nice red without that orangy tint. I went ahead and ordered the IH 50 from my local paint supplier (BASF Limco brand) in an Acrylic Enamel ($200/gal), and I sure hope it isn't TOO dark of a red. Been wanting to try it and see what it looks like. I'm going to paint a 1968 Farmall 140 tomorrow a little after lunch if everything goes right. More pictures of the finished product. I really like the finished shade of the 2150 on this tractor. I find it nice and dark. No orange tint. 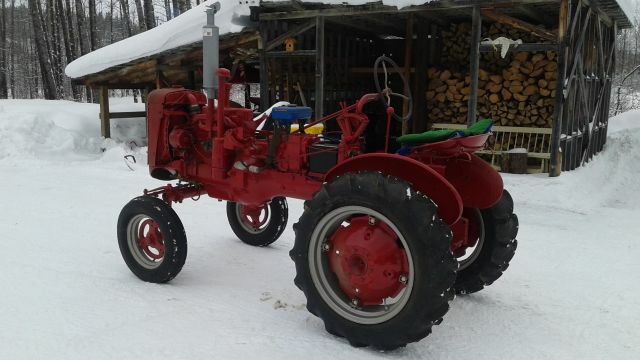 My son wanted the "darker" IH red on his cub when we rebuilt it, so not knowing any better, I went and got IH50. I tried the one from Sherwin Williams (small sample can), and felt it wwas too brown/maroon. So I went and got the IH50 from NAPA, very much a deep cherry red. I have to disagree with Al based on this one experience, that IH 50 red was noticeably darker than 2150. The son was ecstatic with it, then later I got to see 2150, and realized we had a totally different color. In all honesty, I like the IH50 better, but will likely never do another one in automotive paint, due to cost. I will go get a slightly cheaper paint, since mine are workers. Here is the "harvester red" I had mixed up from the paint store. It's BASF Limco paint and is supposed to be their version of IH-50. I feel like it's more like the IH 2150 and it's not dark enough. It does look really good though. This isn't the same tractor as above although the color looks very close......that's why I'm led to believe that this paint color is the IH-2150 like the tractor is above that is painted with Iron Guard 2150. What do you all think? Do you think it looks like IH 50 or more like IH 2150? Just curious on your opinions but whatever the shade I think it looks real good. I realize it is a picture and not in person, but I would still like to hear feedback. 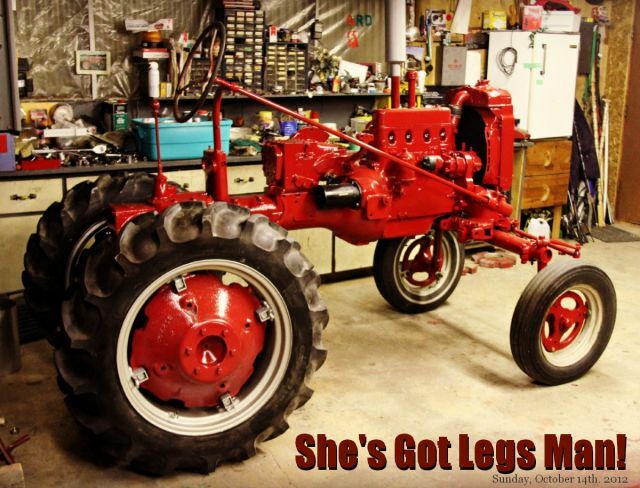 AL Farmall Boy wrote: What do you all think? Do you think it looks like IH 50 or more like IH 2150? Just curious on your opinions but whatever the shade I think it looks real good. I realize it is a picture and not in person, but I would still like to hear feedback. That's the point, you really couldn't tell much difference between the two, they are so similar. If you go with the "new" red that IH used in the late 80s, to me that is a significantly darker red.